Look to OSHA for guidance for a safe workplace. As a small farm operation, you probably already know that farms are mostly under the radar of OSHA safety and health inspections. The US government granted small agricultural enterprises an exemption from OSHA jurisdiction. This exemption is for farms who hire 10 or fewer non-family workers and do not have a temporary labor camp. As OSHA defines it, a temporary labor camp is housing maintained by a farm which is provided as a “required condition of employment and for a discrete, temporary period of time (i.e. for seasonal or temporary employment)”. If you have such a housing arrangement with any number of paid workers, OSHA does have the right to inspect your farm for safety and health compliance violations. Even if you only have one part-time summer worker living on your farm as part of their pay, you would be under OSHA jurisdiction as having a ‘labor camp’. 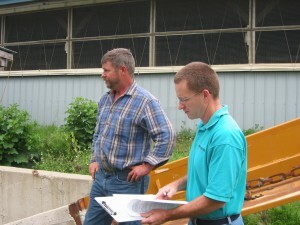 Jim Carrabba (right) of NYCAMH doing an on-farm safety/health walkthrough with a farm manager (photo by NYCAMH staff). OSHA does not conduct random inspections unless there is a program in place targeting a specific hazard or industry. Since the fall of 2013, you might have heard about the New York Dairy Local Emphasis Program. This is a target program of random, full inspections of dairy farms as an attempt to reduce the relatively high number of fatalities and injuries noted on New York dairies. Again, only farms with 11 or more non-family hired workers are under this program. OSHA does conduct inspections on farms under their jurisdiction if there is a referral from another agency, complaint or fatality/severe injury. These types of inspections are designed to investigate the area of the farm under the referral/complaint/incident. There are strict whistle blower rules to protect anyone who contacts OSHA with a complaint. As a general rule, it is very important to become familiar with OSHA regulations and best practices. Even if your farm is not under their jurisdiction, in a court of law, the OSHA regulations are used to determine whether or not an employer was negligent in providing a safe and healthy workplace. It might seem overwhelming at first, but there are some basic steps you can take to start. A full walk-around of your farm using a safety checklist is a great way to begin. Penn State has many great resources; One is the AgSafety4u online course which is geared for new and beginning farmers. For a very detailed look around your farm, use “FARM-HAT”, the Hazard Analysis Tool, available on a website or as a mobile app. This short document gives lots of other resources for specific issues on the farm. If you would like to have a second set of eyes and advice about farm hazards and best practices, you can contact NYCAMH for an on-farm walkthrough. Someone will schedule a time to come out and spend a few hours going through a checklist and answering your questions. This service is available free in New York State as it is supported by the NY Department of Labor. For more information visit the website or for an appointment call 1-800-343-7527 or email info@nycamh.org. This chart, from the Oklahoma Extension Service, NASDonline.org (National Ag Safety Database) shows the hours of safe exposure compared to various decibels of noise. The OSHA website is a great resource when you have very specific questions. Say you want to know more about ‘lockout/tagout’ recommended procedures – they have the actual regulations, FAQ responses, and other resources. It does cover all industries, so it may take a little work to find just what you need. One neglected area of farm health is the use of personal protective equipment (PPE). This includes wearing respirators, earmuffs, gloves, safety glasses, steel-toed shoes, and anything that eliminates or reduces exposure to health hazards. You need to evaluate each job to fully understand when you need protection and then make sure you are using equipment that actually does the job of protecting you. Look at all chemical labels. You may not realize what is actually in the formula. There should always be information about recommended PPE for when you mix and apply these chemicals. Respiratory illnesses from organic dusts, chemicals, and exhaust are more common in farmers. Farmers’ Lung is permanent lung damage due to allergic reactions to molds that affect up to 10% of farmers. Know your respirators – make sure they will do the job and fit you correctly. The National Ag Safety database includes documents and videos on lots of topics including this review of respirator use on farms. Check your hearing protection as well. You may not think the tractor is that loud, but if you’ll be driving it for a few hours you’ll need protection. 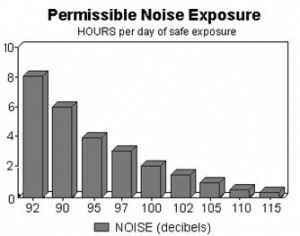 The “Permissible Noise Exposure” table shows the time limits for levels of noise you can take without hearing protection without much damage. To check decibel levels, you can download an app for your mobile phone to get a pretty decent reading – try ‘dB Volume Meter’, ‘TooLoud?’ or ‘deciBel’. You’ll be surprised by the noise you’re being exposed to. Choose the best protection by looking at the NRR number on the labels. Earplugs can be the best and the cheapest (NRR 26 to 31). Knowing that you are providing a safe and healthy workplace is the best reason for putting in the added efforts. You may also find additional benefits if you talk to your insurance agents about what changes you’ve made on the farm. They like nothing better than to insure a farm business that works towards preventing accidents and illnesses and would likely offer you a lower rate. Marybeth Vargha works with the Outreach Team at the New York Center for Agricultural Medicine and Health, part of Bassett Healthcare in Cooperstown, NY and on the family farm in Westford, NY. She can be reached at marybeth.vargha@bassett.org, (607)547-6023 X2231. I’ve always known about workplace safety programs, but I never knew that they were so widespread. It makes sense that you would want to have any employee trained on safety, no matter the job!